Mobile, AL, January 11, 2019 – 43 Years. 43 Locations. Our customers are our number one priority, and thanks to you, Hackbarth Delivery Service has grown to 43 locations in 43 years! Since 1975, each one of our locations has opened as a direct result of our customers’ needs, and because of our customers’ loyalty and support, we are growing again! August 2018 marked our most recent opening – Parkersburg, West Virginia. We now have three locations in this state. This opening followed our large Texas expansion in February 2017, where we added 12 additional Hackbarth locations. This substantial growth has helped extend our family across 10 states in now 43 locations throughout the US Southeast, Midwest and Mid-Atlantic regions. We celebrate these 43 years in business and honor the thousands of drivers, customers and communities we interact with each day. Resulting from this growth, Hackbarth has promoted Todd Parson to the roll of COO and Gary Smith as Vice President of Operational Excellence. Todd Parson is an accomplished logistics professional with over 19 years of experience implementing strategic transportation solutions that have consistently delivered strong results in the same-day delivery/distribution industry. 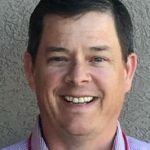 Todd Parson previously lead both operations and sales teams as the COO for a regional courier company, and prior to that was the Regional Director for a national carrier. He earned a degree in economics from the University of Texas in Austin, graduating in 1991. Todd currently lives in the Dallas, Texas area with his wife of 27 years and 3 children, and enjoys spending his free time with his family, being outdoors, cooking and teaching Sunday School. Gary Smith has been in the transportation and logistics business since 1988 and with Hackbarth Delivery for over 12 years. He graduated from Florida State University and began his career with Russell Athletic, spending 10 years as an Industrial Engineer and 3 years managing a Distribution Center. Before Joining Hackbarth, he was the Logistics Manager for Alliance Laundry Systems, which included warehousing and Domestic and International shipping. Gary resides in Marianna, Florida with his wife Rhonda, and has one child, Lauren. Gary enjoys spending free time with family and friends on his boat and according to his wife, he is very skilled at turning a short story into a long one. 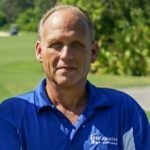 If you ask Rob Hackbarth, Gary is also an avid golfer and plays almost every day, the truth is, he plays, but not often and not very well. Hackbarth Delivery Service is a certified (WBE) woman owned, privately held corporation headquartered in Mobile, Alabama. With 37 warehouse terminal locations and six additional cross docks covering 10 states across the Southeast, Midwest and Mid-Atlantic regions, we are a leading last mile transportation, warehousing and logistics company dedicated to delivering our signature KYSO® Service. 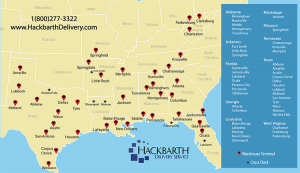 Find out more about Hackbarth Delivery Service, its service offerings, locations and job openings.